Screenful Metrics for JIRA is an add-on to JIRA that allow you to view Screenful dashboards within your JIRA UI. It can be installed to JIRA Cloud instances via the Atlassian Marketplace. I'm using a self-hosted JIRA, can I still use your product? You can still use Screenful, but you can't install the add-on via the Atlassian Marketplace. Signup for a free trial via our website instead. What is the difference between the Screenful add-on and your regular SaaS service? I have an existing Screenful account. Can I install the Screenful add-on? Yes you can, but in order to do so, you have to create a new Screenful account. Please contact support@screenful.me for further instructions. Screenful add-on for JIRA Cloud provides Screenful dashboards embedded within the JIRA UI. However, that's an additional feature so you can still access all the features of the SaaS service even when using the add-on. When using Screenful add-on, you'll be invoiced by Atlassian instead of Screenful. The price will be according to the number of users in your JIRA account. See the pricing page. How do you determine my pricing tier? The pricing tier for the add-on is set automatically based on the number of users in your JIRA account. Learn more from the add-on pricing FAQ. How can I purchase a plan once the free trial runs out? 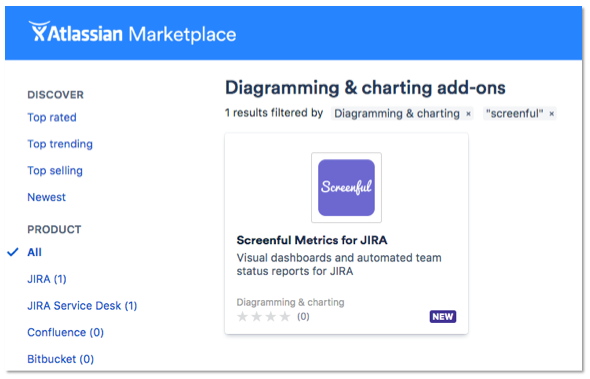 The purchase process for Screenful Metrics for JIRA is the same as purchasing any of the Atlassian Marketplace add-ons. Before your trial ends, you will receive a price quote based on the the number of users in your JIRA account. How do I disable or uninstall the Screenful add-on? You can manage your add-ons by selecting Add-ons ► Manage add-ons from the settings menu on the top right corner of your JIRA. If you Uninstall the Screenful add-on, your Screenful account is removed and all data is deleted immediately. If you Disable the add-on, your Screenful account remains unaffected.